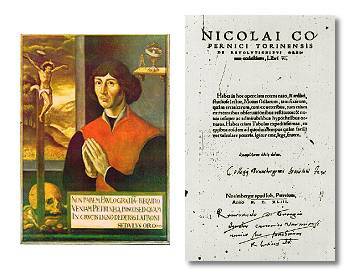 Copernicus was born in Torun on the Vistula in Poland. This polymath studied, not only astronomy, but mathematics, classics, law, and medicine at Krakow and in Italy, and found a job with his uncle, the bishop of Varmia. His idea that the earth is not at the centre of the universe was not, as he himself is at pains to point out, a new one. But the strength of his exposition of it came as an enormous psychological shock to European culture. The earth and its solitary moon had been demoted from centre of the Universe to the status of a mere, very ordinary, planet. We humans, and our little home, were no longer the centre of everything. The religious guardians of tradition ought to have been shocked, as they were later with Galileo. But, at least initially, they supported this new and bold idea. Partly this was because Nicolaus’ literary agent, himself a divine, added a very unauthorised introduction explaining that the new theory was merely to be taken as a convenient fiction to simplify calculations, not as the truth. Furthermore, Copernicus was slightly wrong- he assumed that the planets (which actually move in elipses) must move in circles, for no other reason than circles are the very nicest shape- so astronomers couldn’t verify his ideas by actual observation. Perhaps most importantly, he had already been denounced by the Lutheran church, so it behoved the more powerful Roman church, its bitter rival, to give succor to anyone who had enraged their enemies. In due course, Tycho Brahe’s precise observations and Johannes Kepler’s better mathematics showed that the Copernican model was the right one. We are small and unimportant after all. The Revolutions was placed on the Roman Church’s index of forbidden books in 1616, finally being removed more than three hundred years later, in 1835. Some will say that the ideas I put here are mad, so I dedicate this work to you, Pope Paul III, so that, as a lover of learning, you may protect it from enemies. The universe is clearly a sphere, as that is the most perfect shape. The earth is also a sphere, for we can see its shape shadowed in eclipses or infer it from the way a ship falls below the horizon. Until now it as been accepted that the earth is the centre of the universe. But why, then, do the planets seem to follow such odd paths through the sky, when it is obvious that their motion must be the perfection of a circle? We can tell that the universe is very large, because stars seem always to be at the same angle to the earth, no matter where viewed from. The ancients though the earth must be the centre because all heavy things fall towards centres, an earth is most heavy, and that the earth cannot be in motion for otherwise clouds would drift away as it spun. But if the air of the earth moves too, then clouds will hold their places. I follow ancient Martianus Capella, and think that the beautiful sun is at the centre, followed by the planets on their spheres, in order of the time they take to complete their circuit round it- Mercury, Venus, then the earth with its moon, Mars, Jupiter, saturn and then the fixed sphere of the distant stars. I declare also that the earth varies in the angle of its axis as it goes round the sun, which accounts for the differences of the seasons. There is no clearer way of understanding the apparent motions of the heavenly orbs. This squashed version has largely been based on the Edward Rosen translation of 1978. It should be understood that this is only Book One, the later volumes provided the detailed astronomy to support the basic thesis given here. Not only the descriptive text has been condensed, but the geometric explanations also. In particular, the explanation associated with diagram 2 (they were not numbered in the original) is somewhat different, while that associated with diagram 4 is drastically truncated. Diagram 3 is an actual copy of the illustration in the first printed edition. Diagrams 1 and 4 are re-drawn versions of Copernicus’ manuscript originals, while diagram 2 is an addition of the editor. Apogee: The point in the orbit of an object farthest from the point of reference. eg: the location of a planet at its greatest distance from the earth. Ptolemy: Egyptian cartographer whose Almagest explained the curious motions of the stars and planets by assuming that the earth was at the centre of the universe. Ecliptic: The path of the earth’s yearly cycle. Axis: The imaginary straight line about which a body revolves. Diligent reader, in this new work you have the motions of the fixed stars and planets, reconstituted from ancient as well as recent observations, and embellished by new and marvelous hypotheses. Therefore buy, read, and enjoy this work. Holy Father, some who discover that I here ascribe certain motions to the terrestrial globe will shout that I must be immediately repudiated. But a philosopher’s ideas are not subject to the judgement of ordinary persons, because he endeavours to seek the truth in all things, to the extent permitted to human reason by God. Therefore I long debated whether to publish this volume, or, like the Pythagoreans, to reserve philosophy’s secrets for kinsmen and friends. But the learned Cardinal SchÃ¶nberg, and others, did repeatedly encouraged me to publish, this work being yet buried among my papers the fourth period of nine years. I despaired that the movements of the universe, created by the most systematic Artisan of all, were not better understood by the philosophers, who otherwise examined so precisely the most insignificant trifles. I found in Cicero that Hicetas supposed the earth to move, as did Philolaus and Ecphantusthe the Pythagoreans, and Heraclides. Yet many will still think the idea absurd, so I have dedicated my studies to Your Holiness. For even in my very remote country you are considered the highest authority by virtue of your lofty office and your love for literature and astronomy. Hence you can easily suppress attacks although, as the proverb has it, there is no remedy for a backbite. Perhaps there will be ignorant babblers, who, twisting some passage of Scripture to their purpose, will find fault here. I disregard them. Astronomy is for astronomers, and most useful in correcting the ecclesiastical calendar. All else I leave to the judgement of Your Holiness and other learned astronomers. Lest I now seem to promise more than I can fulfil, I turn to the work itself. Among the many pursuits which invigorate men’s minds, the strongest affection and zeal should, I think, be towards the most beautiful objects, and what is more beautiful than the heavens? Its very Latin names, caelum and mundus, denote sculpture and ornament. On account of heaven’s transcendent perfection philosophers have called it a visible god. Such good arts draw men away from vices, as the Psalmist says. Even Plato shows the utility of astronomy, in dividing time into days and months and years, to keep the state alert to festivals and sacrifices. However, this divine science’s principles and assumptions, called “hypotheses” by the Greeks, have been a source of disagreement. To be sure, Claudius Ptolemy of Alexandria, has come close to perfecting our understanding, yet even the length of the year itself is not agreed. But these difficulties are no excuse for indolence, so, by the grace of God, without whom we can accomplish nothing, I shall attempt to enquire into these matters differently from those who first opened the road to my investigations. First of all, we must note that the universe is spherical. The reason is either that, of all forms, the sphere is the most perfect, needing no joint and being a complete whole; or that it is the most capacious of figures, best suited to enclose and retain all things. The sun, moon, planets and stars, are seen to be of this shape; and wholes strive to become spheres, as is apparent in drops of water. Hence no one will question the attribution of this form to the divine bodies. The earth also is perfectly spherical, yet it is not immediately recognised as such. However, it is clear from the following considerations. A traveler going from any place toward the north, finds that pole of the daily rotation of the stars gradually climbs higher, while the opposite pole drops down. More stars in the north are seen not to set, while in the south certain stars are no longer seen to rise. Moreover, the elevations of the poles have the same ratio everywhere to the portions of the earth that have been traversed. This can happen on no figure other than a sphere. Furthermore, evening eclipses of the sun and moon are not seen by easterners, nor morning eclipses by westerners, while those occurring in between are seen later by easterners but earlier by westerners. The waters also press down into the surface of the sphere, as sailors know, since land which is not seen from a ship is visible from the top of its mast. Likewise, if a light is attached to the top of the mast, as the ship draws away from land, those who remain ashore see the light drop down gradually until it finally disappears, as though setting. It is clear that water, like earth, falls always downwards towards the centre, because of their heaviness. So it is clear that the earth does not have the form of a great uprising curve, as some have said, for if it were there could be no seas inland, nor any islands to be encountered on distant voyages. But it is well known that almost in the middle of the inhabited lands lie the Mediterranean and the Red Seas. Further, Ptolemy did not know of Cathay, a vast territory. We must add the many islands lately discovered, notably America, named after the ship’s captain who found it, which may be a second group of inhabited countries. From all these facts, finally, I think it is clear that land and water together press towards a single centre of gravity, and that there is little water in comparison with earth, even though more water perhaps appears on the surface. The earth must in fact have the shape we see shadowed on the moon in eclipses, namely a perfect circle. Therefore the earth is not flat, as Empedocles and Anaximenes thought; nor drum-shaped, as Leucippus; nor bowl-shaped, as Heraclitus; nor hollow, as Democritus; nor cylindrical, as Ansaximander; nor does it extend infinitely downward, as Xenophanes taught; but it is perfectly round. I shall now recall that the motion of heavenly bodies is circular, since the motion appropriate to a sphere is rotation in a circle, which is the simplest shape, wherein neither beginning nor end can be found. The most conspicuous of the earth’s motions is the daily rotation, which the Greeks call nuchthemeron, in which the skies are perceived as whirling from east to west. But we see the motions of the sun, moon, and the five planets as advancing in the opposite direction, that is, from west to east. Yet these motions differ in many ways. In the first place, they do not swing around the same poles as the first motion, but run obliquely through the zodiac. Secondly, the sun and moon are observed to be sometimes slow, at other times faster in their course. Moreover, the other five planets at some times hold stationary then go backwards. Also, they wander in various ways, straying sometimes to the south and sometimes to the north; which is why they are called “planets” [wanderers]. Furthermore, they are at times nearer to the earth, when they are said to be in perigee; at other times they are farther away, when they are said to be in apogee. We must acknowledge, however, that all these motions are circular, for they continually repeat themselves, and only a circle can bring back the past. To hold otherwise would be to infer some inconsistency or some imposition from without, which is impossible among bodies constituted so perfectly. Yet it is clear that some of the motions of the celestial orbs seem, to us, not to be uniform. The cause may be either that their circles have poles different from the earth’s or that the earth is not at the centre of the circles on which they revolve. Hence I deem it most necessary that we should carefully scrutinise the relation of the earth to the heavens. DOES CIRCULAR MOTION SUIT THE EARTH? WHAT IS ITS POSITION? Authorities agree that the earth is at rest in the middle of the universe, and that any contrary view is inconceivable or entirely silly. Nevertheless, if we examine the matter more carefully, we shall see that this is by no means to be disregarded. Every observed change of place is caused by a motion of either the observed object or of the observer or, of course, by an unequal displacement of each. It is the earth from which the celestial dance is beheld, therefore, if motion is ascribed to the earth, all things outside will appear as though they were moving past it. If you will allow that the heavens have no part in this motion but that the earth rotates daily from west to east, you will find that this accounts for the apparent rising and setting of the sun, moon, stars and planets. An important question follows concerning the earth’s position. Heretofore there has been virtually unanimous acceptance that the middle of the universe is the earth. But the fact that the same planets are observed nearer to the earth and farther away necessarily proves that the centre of the earth is not the centre of their circles. It will occasion no surprise if, in addition to the daily rotation, some other motion is assigned to the earth. That the earth travels with several motions, and that it is one of the heavenly bodies are said to have been the opinions of Philolaus the Pythagorean. He was no ordinary astronomer, inasmuch as Plato did not delay going to Italy for the sake of visiting him, as Plato’s biographers report. The massive bulk of the earth does indeed shrink to insignificance in comparison with the size of the heavens. As can be demonstrated. In the first diagram, let the circle ABCD be the circle of the horizon, and let E be the position from which we observe the motion of the stars. At a certain season the first point of the Crab will be seen to rise at C as the Goat is perceived to be setting at A. Yet at another season, as the Goat rises at B while the Crab is seen setting at D. From this it is very clear that the fixed stars appear to have the motion of a great circle. Yet, to look at the second diagram, if two observers at different parts of the earth, F and G, were to draw a line towards a distant star, S, it is clear that each should measure a different angle between that line and the earth about them. It is also clear that if the star be farther away, the difference between the angles of F and G would be less, and that if the star was at an extraordinarily great distance then no difference would be observed. Such is the case. They become like parallel lines, because their terminus is enormously remote. This reasoning certainly makes it quite clear that the heavens are immense by comparison with the earth. But it does not follow that the earth must be at rest in the middle of the universe. Indeed, it is less likely that the whole vast universe should rotate in just twenty-four hours, than the small earth do so. The argument that what is nearest the centre moves the least, proves nothing about the position of the earth. If the heavens are a single sphere, revolving around the poles, then those parts nearest the pole will move most slowly, as we see happens when we observe the little bear. But if the earth had a motion with the whole celestial sphere, though in a smaller circle, then the daily risings and settings of the sun and other celestial bodies would not be seen. But it is quite known that things travelling in a small orbit move faster than those in a larger one. Thus, saturn revolves in thirty years and the moon, undoubtedly nearest the earth, completes its course in one month, while the earth revolves in one day. But from this, we can know nothing of the earth’s position, except to see that the heavens are of almost unlimited size compared to the earth. The ancient philosophers argued that all things that have weight are, by nature, borne towards the very centre of the heaviest of them, and earth is the heaviest element of all, drawing things towards itself. It seems to follow that all heavy things come to rest at the middle. Thus, then, will the earth be at rest in the middle. Further, according to Aristotle, the perfect motion of a single simple body is simple- either straight, being upward or downward, or circular. To be carried downward, that is, to seek the middle, is a property only of earth and water, which are considered heavy; on the other hand, air and fire, which are endowed with lightness, move upward and away from the middle. To these four elements it seems reasonable to assign straight motion, but to the heavenly bodies, circular motion around the middle. This is what Aristotle says. Ptolemy of Alexandria remarks that, if the earth were to move in a daily rotation, its motion would have to be so exceedingly violent and fast that all things would be thrown off from its surface. The earth would long ago have burst asunder, he says, and dropped out of the skies (a quite preposterous notion). Objects would not be seen to fall perpendicularly, as their appointed place would meantime have been moved on. Moreover, clouds and things floating in the air would be seen drifting always westward. For these and similar reasons the ancients insist that the earth remains at rest in the middle of the universe. Yet if anyone believes that the earth rotates, surely he will hold that its motion is natural, and what is brought into existence by nature cannot be violent for it will always be well-ordered so as to long endure. Ptolemy has no cause, then, to fear that the earth will be disrupted by a rotation created through natures handiwork, which is quite different from what art or human intelligence can accomplish. But why does he not feel this apprehension even more for the universe, whose motion must be the swifter, being much bigger than the earth? For when a ship is floating calmly along, the sailors suppose that they are stationary. In the same way, the motion of the earth can unquestionably produce the impression that the entire universe is rotating. Then what about the clouds and the other things that hang in the air, or the bodies that fall down, or rise aloft? We would say that not only the earth rotates, but also the air with the earth. The air closest to the earth will accordingly seem to be still, and so will the things suspended in it. Furthermore, bodies that are carried upward and downward do not execute a simple, uniform motion. For whatever falls moves slowly at first but increases its speed as it drops. On the other hand, we see that fire rises, then slackens all at once. Circular motion, however, always rolls along uniformly. But rectilinear motion quickly stops, bringing bodies to their own place, where their motion ends. Hence we can say that “circular” is with “rectilinear” as “being alive” with “being sick”. Surely Aristotle’s division of simple motion into three types is merely a logical exercise. Moreover, the quality of immobility is deemed more divine than change and instability, and therefore better suited to the earth than to the universe. But, it would seem quite absurd to attribute motion to the framework of space, and not, more appropriately, to that which occupies space, namely, the earth. Last of all, the planets clearly approach closer to the earth and recede farther from it. You see, then, that all these arguments make it more likely that the earth moves than that it is at rest. This is enough, in my opinion, about the first part of the question. CAN SEVERAL MOTIONS BE ATTRIBUTED TO THE EARTH, THE CENTER OF THE UNIVERSE? Since nothing prevents the earth from moving, we should now consider whether it has one motion, or several, and whether it can be regarded as one of the planets. For, it is clear from the apparent nonuniform motion of the planets and the way that they vary in their distances from the earth, that these phenomena cannot be explained by circles concentric with the earth. Therefore, the further question arises whether the centre of the universe is identical with the centre of terrestrial gravity or with some other point. For my part I believe that gravity is nothing but a certain natural desire, implanted by the Creator, to gather all things towards the unity of a globe. This impulse is present, we may suppose, also in the sun, moon, and the other planets, so that through its operation they remain as spheres. But, they swing round their circuits in diverse ways. If, then, we accept that the sun is at rest, and the earth and other planets revolve around it, this will explain the risings and settings of the zodiacal signs and fixed stars. The positions of the planets, as well as their retrogradations and resumptions of forward motion will be recognised as being, not movements of the planets, but a mere appearance caused by the motion of the earth. All these facts are disclosed to us by observing the order in which the planets follow one another, and by the harmony of the entire universe, if only we look at the matter, as the saying goes, with both eyes. Of all things visible, that the highest is the heaven of the fixed stars, is doubted by nobody. But the ancient philosophers, assuming that, among objects moving equally fast, those farther away seem to travel more slowly, as is proved in Euclid’s Optics. The moon revolves in the shortest period of time because, therefore, it runs on the smallest circle, nearest to the earth. The highest planet, on the other hand, is Saturn, which completes the biggest circuit in the longest time. Below it is Jupiter, followed by Mars. According to Plato’s followers, all the planets, being dark bodies, shine because they receive sunlight. Thus, they must be above the sun, otherwise we would see them sometimes obscured by shadows, which we do not. In my judgement, therefore, we may look to the ideas of Martianus Capella, the author of an encyclopedia, and other Latin writers, who thought that Venus and Mercury do not circle the earth, but have “other circles”. And what other circle might there be, but that of the sun? If anyone seizes on this notion, may he not also think likewise of Saturn, Jupiter, and Mars, and of the earth too? Hence I feel no shame in asserting that the moon and the earth traverse a grand circle amid the rest of the planets in an annual revolution around the sun. Moreover, since the sun remains stationary, whatever appears as a motion of the sun is really due rather to the motion of the earth. This should be admitted, I believe, in preference to perplexing the mind with an almost infinite multitude of spheres, as must be done by those astronomers who try to fix the earth in the middle of the universe. On the contrary, we should rather heed the wisdom of nature, which especially avoids producing anything superfluous or useless, and frequently endows a single thing with many effects. The first and the highest sphere is of the fixed stars, which contains everything, and is therefore immovable. This is followed by the sphere of the first planet, Saturn, which completes its circuit in 30 years. After Saturn, Jupiter revolves in 12 years. Then Mars in 2 years. The fourth place is the earth, together with its moon. In the fifth place Venus in 9 months. Lastly, in the sixth place, Mercury, which revolves in 80 days. At rest, however, in the middle of everything is the sun. For in this most beautiful temple, who would place this lamp in another or better position than that from which it can light up the whole thing at the same time? For, is not the sun called ‘the lantern of the universe’ and, ‘its mind’ and by others ‘its ruler’? Hermes the Thrice Greatest calls it ‘a visible god’, and Sophocles’ Electra, ‘the all-seeing’. Thus indeed, as though upon a royal throne, the sun governs the family of planets revolving around it. In this arrangement, therefore, we discover a marvelous symmetry of the universe, a harmonious linkage between the motion of the spheres and their size, such as can be found in no other way. From this, the attentive student may explain the many and curious motions of the planets. Yet no such curiosities appear in the fixed stars. This proves their immense height, which makes the sphere of their annual motion vanish from before our eyes. For, every visible object has some measure of distance beyond which it is no longer seen, as is demonstrated in optics. From Saturn, the highest of the planets, to the sphere of the fixed stars there is an additional gap of the largest size. This is shown by the twinkling lights of the stars. By this token in particular they are distinguished from the planets, for there had to be a very great difference between what moves and what does not move. So vast, without any question, is the divine handiwork of the most excellent Almighty. So, the planets bear witness to the earth’s mobility, and this motion must be admitted to be of three sorts. The first sort of motion, named nuchthemeron by the Greeks, as I said, is the rotation of day and night. This turns the earth around its equator from east to west, just as the universe appears to turn in the opposite way. The second is the yearly motion of the earth around the sun. Its direction is likewise from west to east, because of it, the sun seems to move through the zodiac. Thus, for example, when the earth’s centre is passing through the Goat, the sun appears to be traversing the Crab; with the earth in the Water Bearer, the sun seems to be in the Lion, and so on. It must also be understood that as the yearly motion proceeds, so the angle of the earth’s axis also changes. For this must account for the variance of the length of days and nights in winter and summer. Since these are matters which crave to be set before our eyes rather than spoken of, let us draw the diagram number four. Here is inscribed a circle ABCD, which represents the annual path of the earth’s ecliptic around the sun, which is at E. I shall divide this circle into four parts. Let A represent the first point of the Crab, B of the Balance, C of the Goat, and D of the Ram. At each of these points I shall draw a circle FGHI to represent the earth when at that position. You will see that I have not shown all these things in the same plane, but rather with the earth’s ecliptic ABCD viewed, as it were, from above, and the globes of the earth FGHI viewed, as it were, from the side. Now, you will see that the axis of the earth, FH, does, at different seasons, present a different angle towards the sun. Under the conditions thus set forth, the earth’s inhabitants will see the sun undergo the winter solstice in the Goat. This occurs because the greatest northward inclination, H, is turned toward the sun. And so for the other seasons, where the inclination of the earth will bring a greater or lesser part of its surface toward or away from the sun. However, the annual inclination is not always equal. There is a slight variation, discovered only as it grew larger with the passage of time. From Ptolemy’s day to ours, the precession of the equinoxes amounts to almost 21Â°. To explain this, some people have told that the sphere of the fixed stars has a movement governed by a further, ninth, or a tenth, surmounting sphere. Yet they do not in the least attain their goal of explaining the movement of the orbs, which I can reach by accepting that the earth does move. This principle I shall use as a hypothesis in the demonstration of the other motions in the following books.